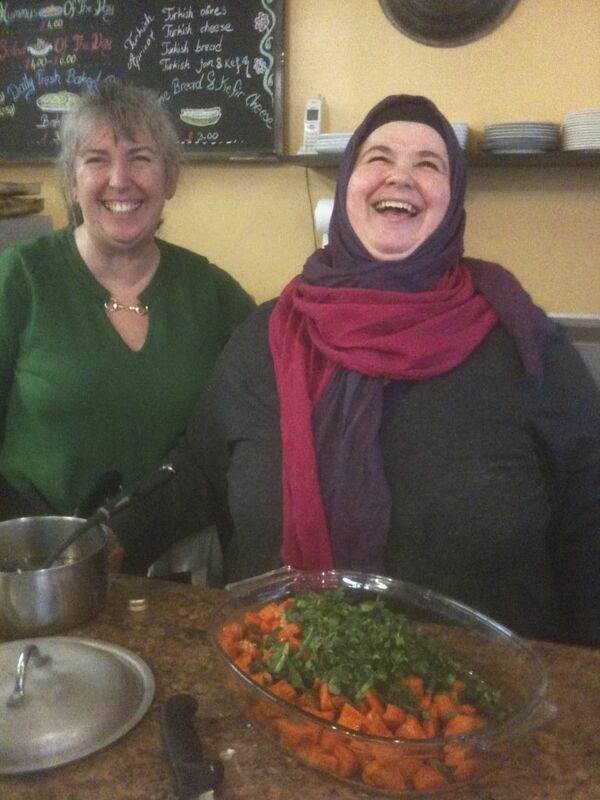 I stopped into Istanbul Imports in Seattle's Fremont neighborhood today, and was surprised to see the owners have installed a full kitchen in the front of the shop along side a small restaurant called the Cafe Turko. 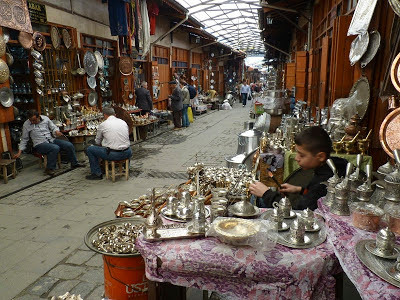 The smell of cardamon tea and homemade pastries filled with dates and figs brought me back to the time I spent in Gaziantep, Turkey, a town near the Syrian border in Southeastern Turkey known for its food and copper crafts. 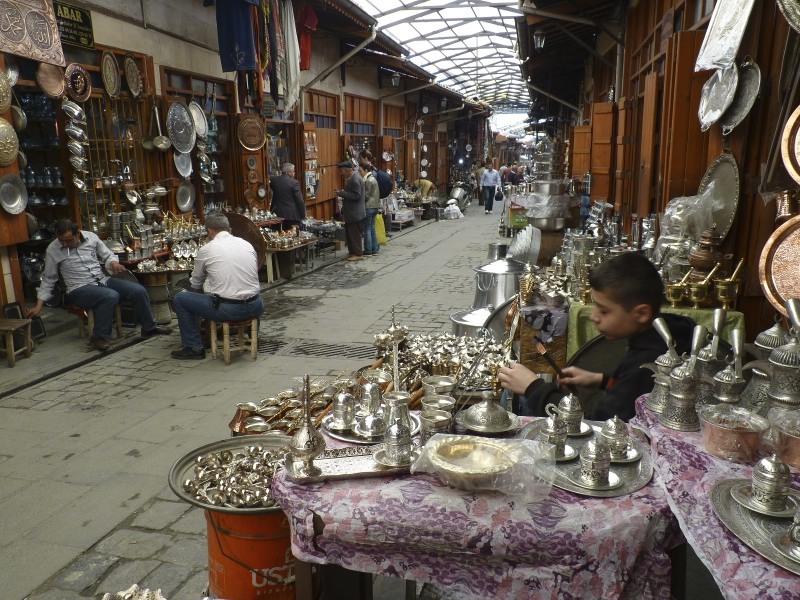 If you listen to NPR, you've probably heard of Gaziantep. The international journalists covering the war in Syria are based there, and use the city as their dateline when reporting on air. Istanbul Imports, owned by Gencer and Sureyya Gorkeri, has been in business in Fremont for 11 years at 754 N. 34th St., and before that in Seattle's Lower Queen Anne neighborhood. The couple opened the cafe a few weeks ago, but since the location is on a side street, away from the main drag, it's yet to be really discovered. Tables decorated with Turkish fabrics decorate an area near the front window next to an open kitchen where customers can watch Sureyya and her crew work. Sureyya, as it turns out, was born in Gaziantep. Few American travelers get to this part of Eastern Turkey, but they should. Gazianstep or "tep'' as the locals call it, is filled with beautifully-restored 16th century mosques, inns and 9th century stone mansions. 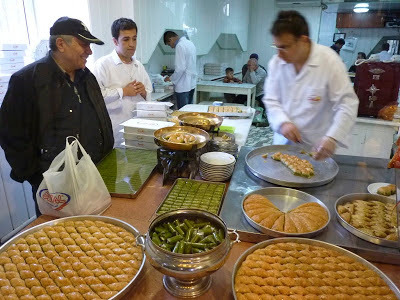 Baklava and other sweets made with pinkish, half-ripe pistachios, is Gaziantep's speciality. Stop by Cafe Turko for a Turkish breakfast, lunch or tea and dessert. Sureyya uses many of her mother's recipes. Try her soup made with marble-size meat balls or the Turkish pizza, a beautiful boat of cooked dough filled with fresh veggies, cheese and sprinkled with pomegranate seeds. Sureyya teaches Mediterranean vegan cooking cooking classes at PCC Natural Markets, and hopes to start classes at the shop in January. I'll sign up just to get her recipe for yam hummus. It's a unique combo of yam, tahini, garlic, olive oil and a dash of cinnamon that Sureyya came up with based on a Turkish recipe for pumpkin hummus. Had lunch and conversation with Sureyya. Both were very enjoyable. Hope to return soon.